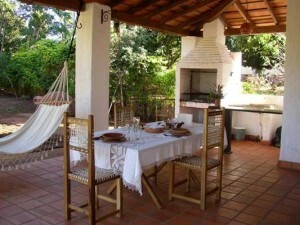 If you would like to visit Santa María and see the work of the Santa Maria Education Fund, you will be very welcome. There is a lot to see and do in Santa María, from taking an ox-cart ride to learning how to dance or make typical Paraguayan food. One of the principal attractions, however, is the museum. Santa María has what is in many people’s eyes the finest of all the museums of the Reductions, situated in an original casa de indios (“house of Indians”), beautifully restored with international aid. 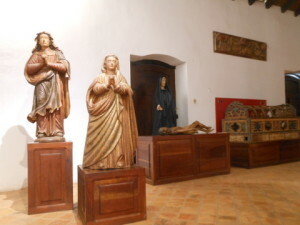 It houses some 50 carved wooden statues of saints and holy figures: entering the final room, devoted to the Passion of Christ, is a mystical experience. The Santa Maria Hotel is another enterprise founded by Margaret Hebblethwaite, and caters for overseas visitors who may have no Spanish. It is run by Milciades Mancuello who speaks excellent English and completed his Business Administration degree with the help of a scholarship from the Fund. The hotel caters for travellers from all over the world, who come to visit the Jesuit Missions, explore the wonderful countryside, and discover local customs, food, dance and music. The staff are happy to receive individuals and groups and to give them as much support as they need to reach Santa Maria and to visit the sites and projects that interest them. Email the Hotel on info@santamariahotel.org for more information. 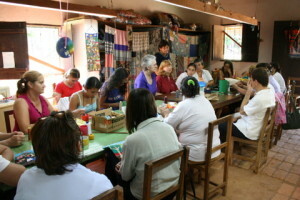 Almost next door to the Santa María Hotel you will find the workshop of the sewing co-operative, the Taller de Hermandad, founded more than 25 years ago, with the support of the Sisters of the Company of Mary Our Lady. A group of about 30 women meet morning and afternoon to produce beautiful, hand-sewn, appliqué craftwork, showing traditional scenes from peasant life. Email them on info@santamariadefe.com for more information and to make an order to be sent abroad.